In my opinion, one of the crucial things about blogging is taking drool-worthy shots of food as we all first eat with our eyes. I have no idea about professional food styling/photography but it’s something I would like to learn and be able to apply one day because I’d like do a little more than the simple “white plate, white background” (but I must admit, it’s just much easier and cheaper that way). Food styling is definitely not cheap; there are many different props one would need to buy, linen, odd glassware and crockery etc, but it does makes a huge difference to the photos. So when Dario tweeted about the possibility of doing a food blogger’s food styling/photography session with him I put my hand up as I wanted to learn a few tricks from him as his photos are always stunning. I joined forces with Karen and we baked up a storm to learn a thing or two about food photography. We came armed with two recipes each to tackle and worked with Dario to brainstorm some ideas about what we think each photo would look like. With Summer being around the corner I really wanted to make a dessert which featured mangoes in it. 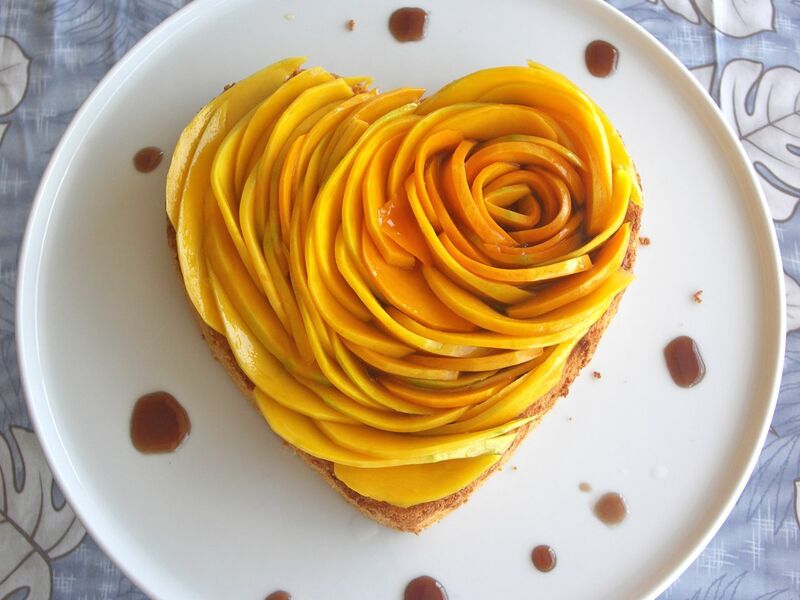 I wanted to make a mango cake like this but unfortunately I do not have the skills to make a beautiful rose out of mangoes (maybe one day though). My all time favourite dessert is pannacotta so I thought about incorporating mangoes in it and serving it with a jasmine tea syrup to jazz it up a bit. We walked into his studio to find huge windows letting in a lot of natural light, a lot of camera gear, a small-ish kitchen with a wide selection of props, backdrops and cabinets of food styling utensils. Dario asks “Do you shoot with flash?”, we both looked at him thinking “Are you serious/crazy?! Everyone know that you don’t shoot food with flash” but apparently he does as it allows him to have more control over the light source so it was going to be interesting watching him shoot our desserts with flash and to see how these pictures would turn out. The curtains were drawn back, it was pitch dark, there was a soft box placed near the photo set up for the light source and little mirrors around the desserts to bounce off the light to highlight certain areas. You can view such set ups here and here. I’m really surprised by how fantastic the photos turned out with flash and thankful for Dario for showing us a few tricks of the trade. And as for the pannacotta? It was smooth, creamy and wobbly (everything you’d expect from a pannacotta). Even though you could taste the mango, I don’t think there’s any harm in adding a little more mango puree to the mixture (just make sure you adjust the dairy content though) and I think it would be nice if coconut milk or cream was used as a substitute. Peel mango and obtain all the flesh. Blend up and pass it through a sieve. Reserve 1 cup of puree until required (the rest can be used to make smoothies etc). In a medium bowl, sprinkle gelatin over milk and let it stand for 5 minutes. Meanwhile, in a medium saucepan heat cream and sugar over medium heat until sugar dissolves and bubbles form around the edge. Remove from heat. Pour cream mixture into gelatin mixture and stir until gelatin dissolves. Pour into 6 ramekins/dariole moulds, tap on counter lightly to release any bubbles and refrigerate until set (about 3 hours). To unmold the pannacotta, dip the moulds in a small bowl half-filled with hot water for about 10 seconds, invert onto plate and slightly shake to loosen (if still slightly stuck then continue shaking – do not place back into hot water which would result in a pool of melted pannacotta mixture). Serve with cooled jasmine tea syrup and edible flower petals (if using). Combine the water and sugar in a saucepan over medium-high heat until sugar dissolves and then bring to a boil. Cook for about 8 minutes until volume has reduced by about half. Remove from heat and add tea leaves and steep for 4 minutes, strain leaves. Cool and refrigerate until required. Here’s a preview of the other dessert to come. yummm the boy loves pannacotta thanks for the recipe i cant wait to give it a try! Great work Phuoc, I love it thanks! Wow its styled perfectly! Not to mention looks delicious! Lovely recipe and photos. Will you be doing a post sharing some of the tips and tricks that you learnt on the day? I’ve really been trying to focus on the white balance in the last four/five months. It’s amazng what difference setting up the white balance correctly makes to my pics. Next is composition. There is so much to learn! So much that I’m thinking of taking a photography course. Stunning photos and fantastic recipe! What more can I ask for. Well done. Phuoc 🙂 It’s Phuocalicious! It’s amazing how a few tricks can result in a fantastic photo. Phuoc your photos are awesome. I have so much to learn about taking a good photograph. Hopefully I can be as good as so many food bloggers out there. Mango Panacotta yum. Anything with mangoes is a winner for me. WoW this dessert is summer on a plate! Stunning photos too – had a look at the set up and it really makes me feel like such a noob when taking photos at home! Can’t wait to read about the next dessert for more delicious photos! What a lovely sounding and looking dessert – great idea to add mango to pannacotta. Beautiful photos – sounds like a fascinating workshop! I’d love to hear about the tips you gleaned. The photos do look stunning, they do your dessert justice. I’m looking a Phuoc load more desserts and plenty of delicious styling! I’m looking forward to a Phuoc load more desserts and plenty of delicious styling! Yeah, Dario sure knows how to use artificial light without it looking artificial. It helps a lot as well to have a gorgeous wobbly panna cotta that you made – something this yummy is certainly going to be a pleasure to photograph and even more to eat! Gorgeous recipe and the floral touches make it really elegant =] Also – omg @ that mango cake rose arrangement. Next post methinks? Chocolatesuze: I hope he likes it! Dario: Thanks for your time and help with getting these gorgeous pics together. Jacq: Thanks Jacq! That was my personal touch to the dish and I’m glad you liked it. Bring on Summer! Richard: Well the tips I learnt were about lighting during photographing and a bit of post-production editing, for contrast and sharpening pics. I think Dario would be a better expert to talk to about these matters as I’m sure he’ll be able to provide so much more info than me. Katherine: Thanks Kath! Don’t worry, I’m still learning too! Gianna: I know what you mean! I don’t have the space to have a set up like that, hopefully I’ll be able to make do with the limited space that I do have though and take beautiful pics..
Sarah: Thanks! Tips were mainly about manipulating it the light source to highlight/deflect different aspects of the photo and post-photography editing. Bake in Paris: It is interesting to learn that you can take stunning pics with flash, truely an eye opener for me.